Can You Play Pro Soccer with Just One Foot? In soccer, do you really need to be able to play with both feet? You hear soccer coaches say all the time that you have to work on striking and passing the ball with both feet, but is that really true? Quote from Zlatan Ibrahimovic: "Lionel Messi does not need his right foot. He only uses the left and he's still the best in the world. Imagine if he also used his right foot, then we would have a serious problem." I know soccer coaches stress this all the time, but there are plenty of world-class players who can’t shoot or cross with their non-favored foot. It seems like even if you’re playing in La Liga, the English Premier League, Serie A, the Bundesliga, or even the World Cup final, you can get away with playing soccer with just one foot. Look at all the great players who are known for mainly their left foot: Robin van Persie, Marco Van Basten, Michael Laudrup, Guti, Roberto Carlos, Marco Etcheverry, Arjen Robben, and Messi, with his favored left foot. And oh yeah, somebody named Ryan Giggs: Who has a simply legendary left foot that he’s still torturing teams with as he gets closer and closer to 40 years old. Need another example? How about Brazilian and former Barcelona midfielder Rivaldo, who could get away with playing with just his left foot and would do so to an almost arrogant and comical extent. I remember seeing him spin around in a circle, keeping the ball tethered to his favored left foot, as opposing Sevilla players tried in vain to take the ball from him. His left foot was so exceptional that he could toy with other defenders. And I guess that's the key, if you’re going to use just one foot in soccer then this foot better be exceptional. There are others though. There’s Arjen Robben of Holland and Bayern Munich. It was his left foot that nearly won the Champions League and the World Cup final in the same year. How many times have you heard the announcer say Robben wants to cut inside to shoot with his left foot? How many times did he score by cutting in with his favored left foot? Too many. And it wasn’t like this was a surprise, as though players and coaches didn’t know Robben likes to cut in with his left and doesn't really want to use his right at all. His weaker right foot wasn’t a secret. Yet other teams and defenses couldn’t stop him. So, why not follow Rivaldo and Robben’s lead and focus just on developing one extremely skillful foot? It's something for soccer coaches to think about with some of their players. His signature move is very well known: Cutting inside from the left flank and either passing or shooting. Since 2009, under the new Bayern Munich coach Louis van Gaal, Lahm has been requested to play on the right flank along side Dutch ace Arjen Robben. There are a host of great players who can play great soccer with either foot, Pavel Nedved and Wesley Sneijder come to mind. You wouldn't know which foot these two favor. And there are many others of course, Cristiano Ronaldo and Xabi Alonso at Real Madrid. And then legends of the game like Pele and George Best, who were both known for their ability to play with either foot. The game doesn't care though. As the minutes click by there will come those moments when the other foot will be called upon. And if it's not up to snuff the game will make the player look foolish. The cross comes and falls to your foot and you have no time to do anything but shot. The game doesn't care what foot you like to play with. Tactically, these days, coaches are putting players who have a favored foot on the opposite side of the field, just so they can cut in and shoot with that favored foot. Left footed players are being placed on the right side, players like Robben and Adam Johnson over at Manchester City, who gave Liverpool fits doing just this. How in the world did Capello not take Johnson to South Africa? And then right-footed players are playing on the left, so they can cut in with their right foot. How many times have you heard an announcer say, after a player has muffed a cross or missed a clear goal scoring chance, ‘he wished he had the ball on his stronger foot’? And there's the key, there are moments when you need the other foot to be strong. Those moments when you don't have the time or can't get the ball on to your stronger foot. And if you try to, the goal scoring chance evaporates. But can your weaker foot ever become as strong as your dominant foot? For me, it always seems like my left foot just isn’t as sharp as my right, even though I’ve spent plenty of timing playing with my left. Of course I can play with my left foot: dribble, pass, cross and shoot. But it’s just not as sharp or as strong. It doesn’t feel as comfortable as my right. I have to focus more when I’m using my left and prefer to strike the ball with the inside of my left foot. Try to bend the ball into the goal on the in-swing rather than strike it straight on with the laces. I think this is common though. Plenty of right-footed wingers or defenders can cut inside and bend the ball into the far corner with their left foot, but it’s harder to strike the ball dead on. It’s the angle that makes it easier. Players have to be more conscious about adjusting their bodies to strike the ball cleanly. When you cut inside to bend the ball your body is turned, and you can whip the ball with the inside of your foot. It makes it easier to line up with the ball and angle it into the far corner or low into the near post. If it’s one thing players should know is what they can and can’t do, and to develop ways to score or cross with their weaker foot in certain parts of the field. In other words, have a plan and be prepared to score or cross in those areas with your weaker foot. People also talk about how using your weaker left foot improves the strength and balance in your right foot. To achieve the level of expertise with one foot like Robben or Rivaldo is rare. These players are unique talents, and can get away with playing with just one foot. But how much better would they be if they were good with both feet? The truth is, Robben, Rivaldo and a majority of players playing in Europe or professional soccer on the whole, might have a weaker foot but that weaker foot is pretty strong compared to your average soccer player. For the most part, they are able to make those passes and get good touches with their weaker foot when they have to. They can get done what they need to get done. It’s just that they are world class players with their other favored foot, so why not use that one. As a training exercise, try playing in a practice with just one foot. You can't do it unless you want to lose the ball. It really becomes a shielding exercise in a way, as you're constantly shifting your body to protect the ball. However, this is a good way to improve your weaker foot and see how important it is to have at least a certain amount of comfort with your other foot. You're weaker foot, if not great, should be efficent. Too often you see young players hitting the ball with the outside of the favored foot and having the pass blocked or stolen. If you play with your other foot the pass is easier to make and your body shields the ball from the defender when you make the pass. And too often young players try to score with the outside of the favored foot rather than shooting with their weaker foot. It's tough to put the right bend on the ball in order to score this way. It's one of those things where if you do it, then you better score. Otherwise it's, why didn't you shoot with your other foot, you could have easily just slotted the ball under the on coming keeper? One foot might be a lot better than the other, but you still have to have the ability to do all the fundamental things with the weaker foot. If not, you better have Rivaldo or Robben like skills with that strong foot. 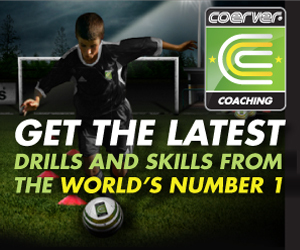 Learn more: shield the ball, improve your first touch and play the way you're facing. 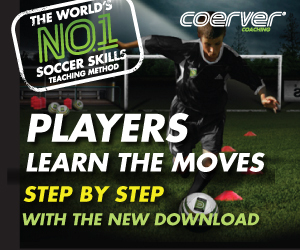 Coerver Coaching: Make Your Move 5 Disc DVD Set 100% Satisfaction Guarantee Buy Now! Want Soccer Practices That Players Enjoy? You'll get all this & much more from this coaching course. Take it from the comfort of your home. Don't delay joining & furthering your education in technical skills training. Instant Access Now!